The national flag of Syria is composed of three horizontal stripes, of the following colors: the upper one is red in color; the central one is white in color and the inferior one of black color. In addition, in the white strip have two stars with five green tips. 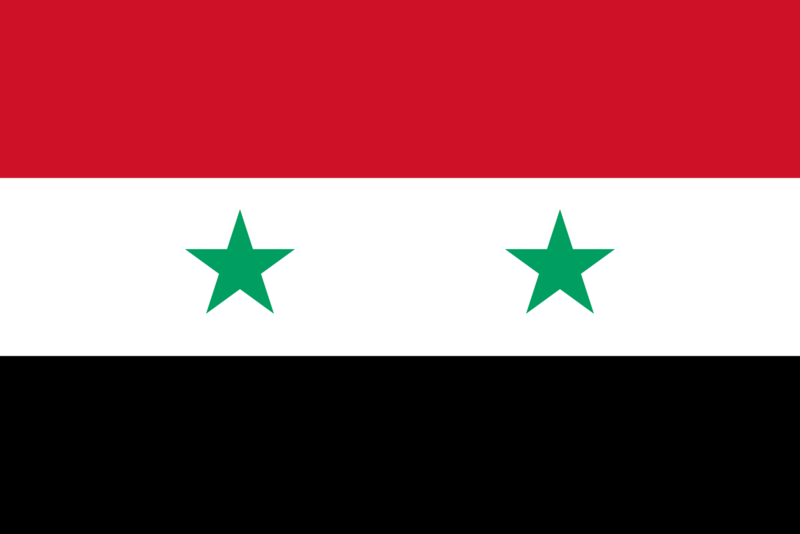 National flag of Syria is adopted in 1980, nevertheless already had used from 1959 to 1961, while it was adhered to the United Arab Republic, an Arab state product of the union of the Syrian Arab Republic union with Egypt (after the dissolution of this one Egypt would maintain the official name of its country as the United Arab Republic until 1971). The flag colors of this country have a political-regional significance, and are shared by other flags, for example those of Egypt, Sudan, Iraq and Yemen. These colors are common within the political ideology known as panarabism, which extols Arab nationalism and proposes that all the Arab peoples of Asia and Africa are culturally a single nation, which must seek its political unity. In the national flag of Syria red represents the blood of the martyrs. The white is by the Umayyad Caliphate (661-750). The black by the Abbasid Caliphate (750-1258). The green color of the stars represents the Rashidun Caliphate (632-661). In the national flag of Syria stars originates in the era of the United Arab Republic which is composed of two countries, Egypt and Syria.